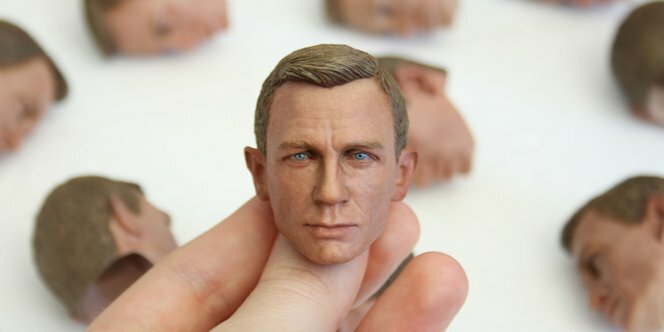 Creating an astonishingly life-like sculpture of actor Daniel Craig is no easy feat—it takes advanced artistry and cutting-edge tools. Emerging 3D technologies, like digital sculpting and desktop stereolithography (SLA) 3D printing, present artists with the ability to create incredibly detailed sculptures that would be impossible to make with any other medium. The artists at Modern Life Workshop create hyper-realistic portrait sculptures of actors and celebrities in iconic roles. Their artwork features tiny details that must be rendered with precision. Meanwhile, the small size of their business requires that each tool in their workflow be affordable and efficient. We asked artist Toria Casarro to walk us through how Modern Life produces portraits, and why Pixologic's ZBrush and the Form 2 were the clear choice for bringing their art to life. Modern Life uses 3D printing to bring their digital sculptures to life. How do you create a portrait? Collect facial references of the person we wish to make a representation of and create a study sheet of the face. Start the digital modeling process in ZBrush. Prepare the project to be printed and to 3D print it. Make a silicone mold of the printed piece to make a life-like flesh-toned resin copy of it. Hand paint the face to bring life and even more realism to the final result. With ZBrush’s new plug-in, digital artists can take designs directly into Formlabs’ PreForm software to easily set up a model to print on a Form 2. Highly detailed sculpts in ZBrush are rendered with precision by the Form 2. How did you get into digital 3D modeling? It's not like we suddenly discovered 3D modeling. We are from a generation that grew up with 3D a bit everywhere, such as video games, movies, simulators, etc. For us, using 3D technology has just been an obvious choice. What has your experience using ZBrush been like? ZBrush is the perfect 3D digital modeling tool. It's the most realistic freehand digital clay sculpting software on the market. In ZBrush, we create the most detailed models that we ever have been able to make. You can work details without limit, and that makes it possible to reach what we call hyper-realism. Modern Life artists sculpt portraits in ZBrush, 3D print the designs, make molds from silicone, and cast multiple parts that are then hand-painted. What has your experience using the Form 2 been like? The Form 2 printer has simply been a revolution for us, as it helped our workshop to become fully autonomous. When we started making 3D printed portraits years ago, we had to deal with other companies that owned very expensive professional 3D printers in order to obtain prints with quality great enough to reproduce all the details of our digital files. Now, owning the Form 2, we have easy access to this great quality. The stereolithography technology of this printer can reproduce even the most complex skin textures that we create. Having this printer also allowed us to cut the delays of prototyping tests, saving time and money. Why do you use 3D printing to make your portraits? Since the beginning, we decided to work with 3D printers because, for us, 3D technologies are synonymous with endless possibilities in terms of the creation of realism in art. Modern Life’s short-run production sculptures are produced using ZBrush and the Form 2. Formlabs and Pixologic teamed up to create a ZBrush plugin that makes 3D printing digital sculpts on the Form 2 a one-click process. Watch the webinar to learn how to leverage these two tools for powerful creative expression.